If you've visiting today from Kid's Clothes Week, welcome, you can find out more about us HERE. And if you're looking for my tutorial on how to make a Piped Peplum Top shown above, you can find that HERE. 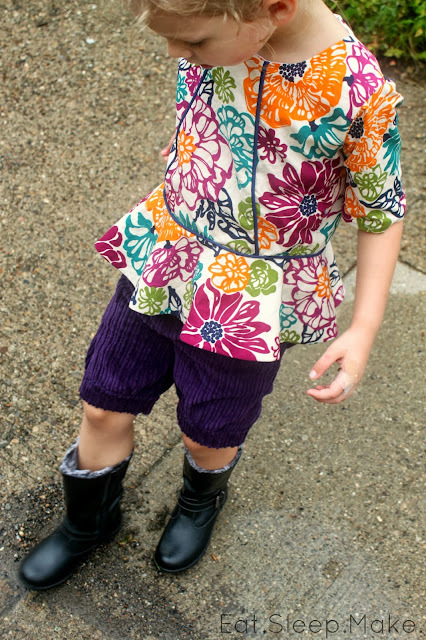 I couldn't make a peplum top in such pretty colors and not make a pair of pants to go along with it, could I? 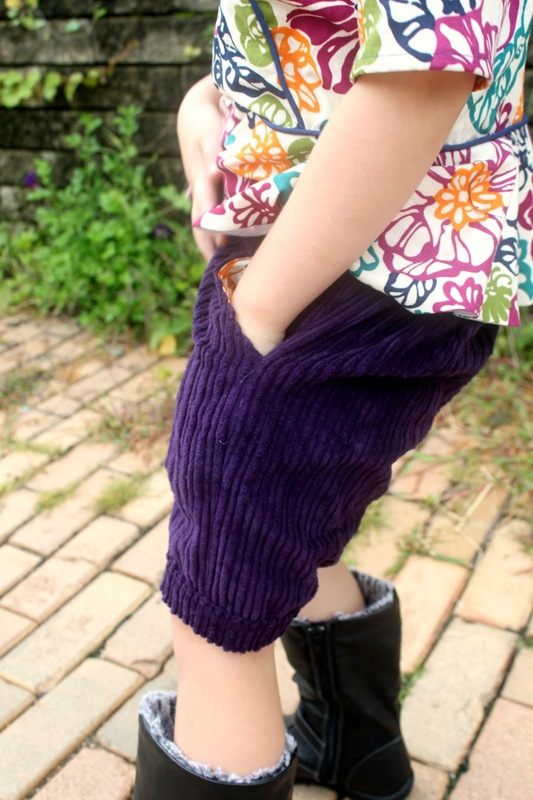 When brainstorming the kind of pants I wanted to make, I couldn't shake the idea of making corduroys. But not just any corduroys, corduroy knickerbockers, or "knickers." 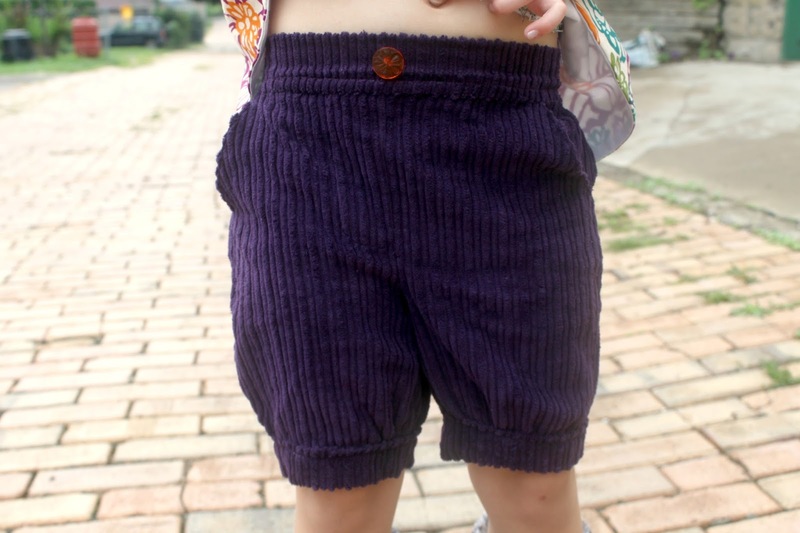 Traditionally, knicker pants are longer pants gathered at the knee or below. 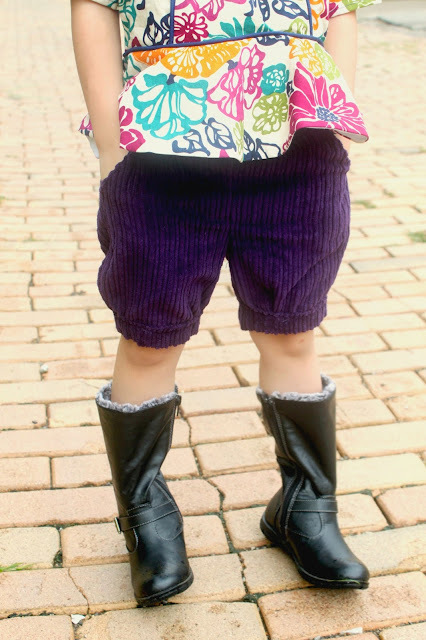 I loved the idea of making a girly version of these for fall, because they keep my daughter's legs nice and warm and pair nicely with boots or long socks. I also wanted to stretch the life of these pants, so I made them with an adjustable waistband! Ready to make a pair? 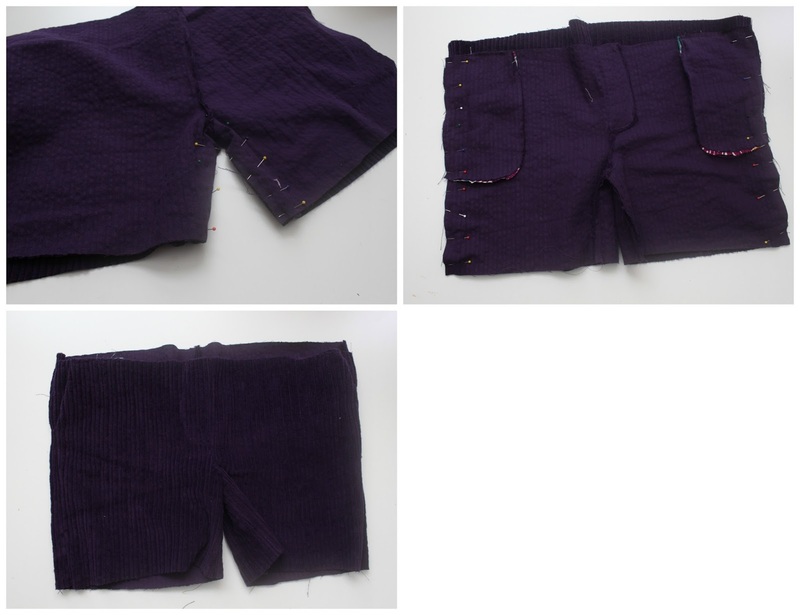 SUPPLIES: pair of shorts to use as a pattern, paper and a pencil to make the pattern, 3/4 yard corduroy, fabric scraps for pockets, 1-inch wide elastic, 3 buttons, disappearing ink marker, measuring tape, sewing machine and sewing supplies. ONE: fold your pants in half and place on your paper. 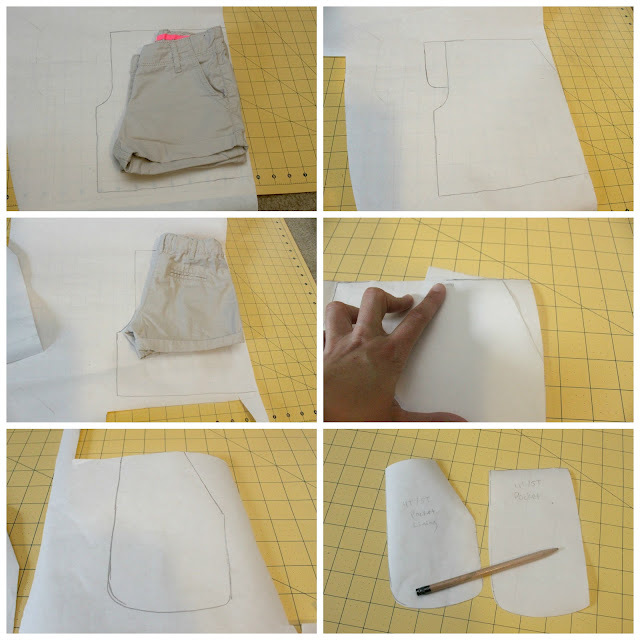 Trace around your pants starting under the waistband (we will be making and attaching the waistband separately, so you don't need to include it in your pattern.) Add in 1/2 inch for seam allowance on the sides, and an extra 4 inches at the bottom. THREE: trace the back of your pants like you did the front, but add an additional inch- 1 1/2 inches to the width. Add on an additional 4 inches to the bottom again. FOUR: use the slant of your pocket to trace a slant for your pocket lining. 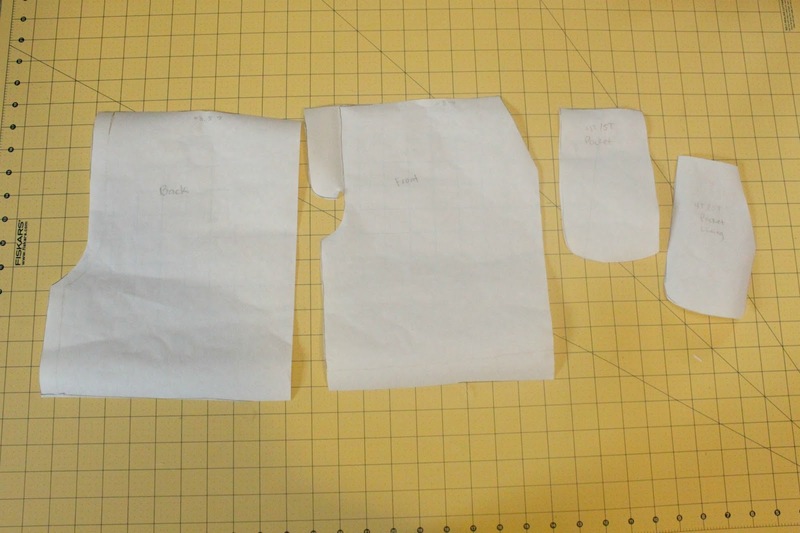 FIVE: draw your pocket lining following the slant you just traced. SIX: draw a second pocket piece without the slant. This will be your main pocket. 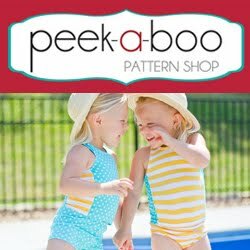 You should now have all of your pattern pieces: a back pants pattern, a front pants pattern with faux fly, pocket, and pocket lining. (Sorry for the poor lining!) Now, cut out all of your pieces as follows: 2 main pocket pieces (right and left pieces), 2 lining pocket pieces from your lining fabric (right and left pieces), 2 back pants pieces (one right and one left), 2 main pants pieces (one right and one left). ONE: place your 2 front pieces with right sides together (RST) and your 2 back pieces with RST and pin along the crotch for the back pieces. For the front pieces, mark a line from the top of your faux fly to the bottom (see above). Pin along the line you drew and the curve of your pants as shown above. Sew along the pinned areas. TWO: open up your front pants piece, and press your faux fly to the right. Pin and sew along the curve of your faux fly. THREE: your finished faux fly should look like the picture above. ONE: place one of your lining pieces and pocket pieces RST and pin along the curve. Sew to attach. TWO: match up the slant of your lining piece to the slant on the front of your pants. Pin and sew along the slant only. THREE: flip your pocket to the other side and Press. It will look like this. Pin along the top and side of the pocket. Use a basting stitch (stitch width and length set to the highest numbers) and baste your pocket to your pants. FOUR: repeat the steps above to attach your other pocket to your pants. ONE: place your front piece on top of your back piece RST and pin along the crotch. Sew. TWO: pin the sides of your pants and sew. THREE: turn your pants inside out and press. 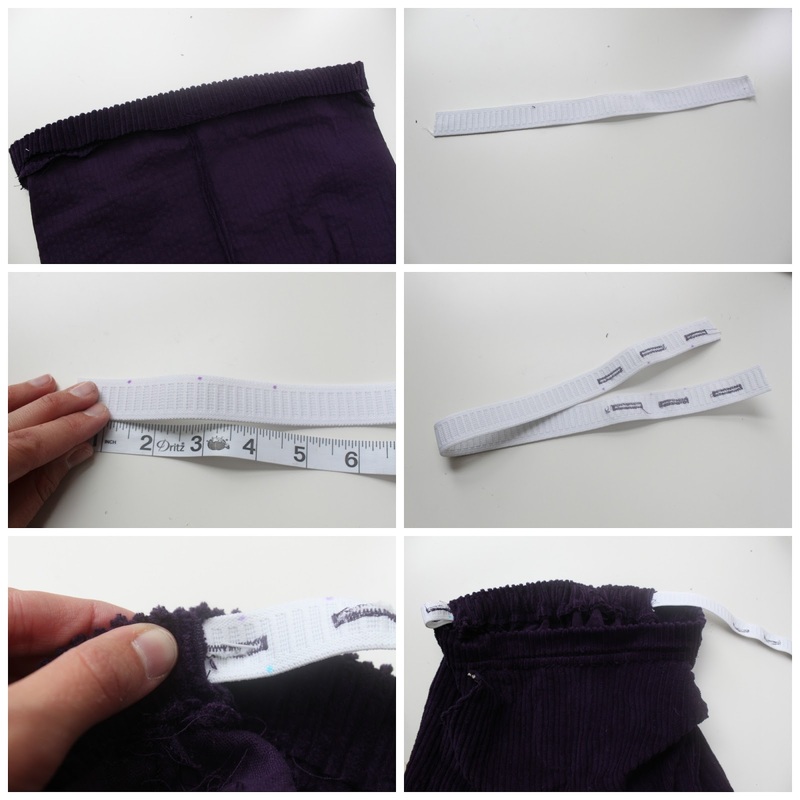 TWO: measure the length from one side seam to the other on the back of your pants only. My length was 17 inches. THREE: Measure this distance along the inside of your waistband and mark at each end with 2 pins (see "x" in photo above.) This indicates the back of your pants. To determine where you need to make buttonholes for your adjustable waistband, you'll need to measure 1 1/2 inches away from each set of x's (toward the center) and mark with pins. FOUR: sew a buttonhole where marked along the inside of your waistband. FIVE: make sure your buttonholes are 1 1/2 inches from each of your side seams, then line up the raw edges of your waistband with the raw edge of your pants with both RST. Pin. SIX: sew along the raw edges to attach. ONE: fold your waistband down and finger press the raw edges under. Topstitch around the perimeter of your waistband. TWO: Measure your child's waist and divide by 2 then add 3 inches and cut that amount from your elastic. So for example, my daughter's waist is 22 inches, so I cut a piece of elastic 14 inches long. THREE: measure over 1 inch from the end of your elastic, and make a dot on your elastic with your disappearing ink marker. make subsequent marks every 1 1/2-2 inches. 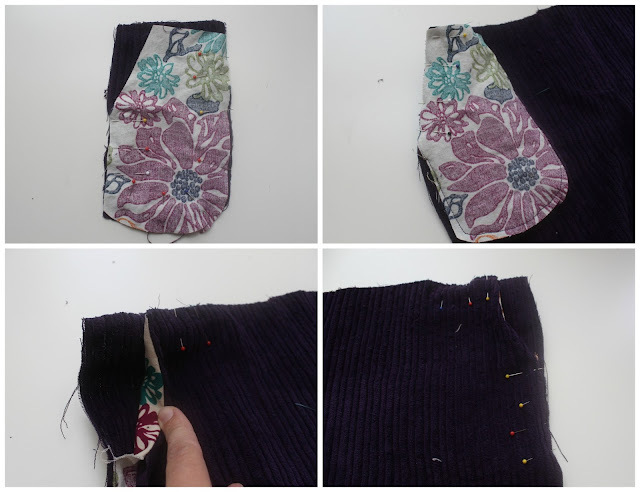 FOUR: sew buttonholes along the marks you made on your elastic. Line up the edge of your elastic with the side seam of your pants like you did before and sew to attach. 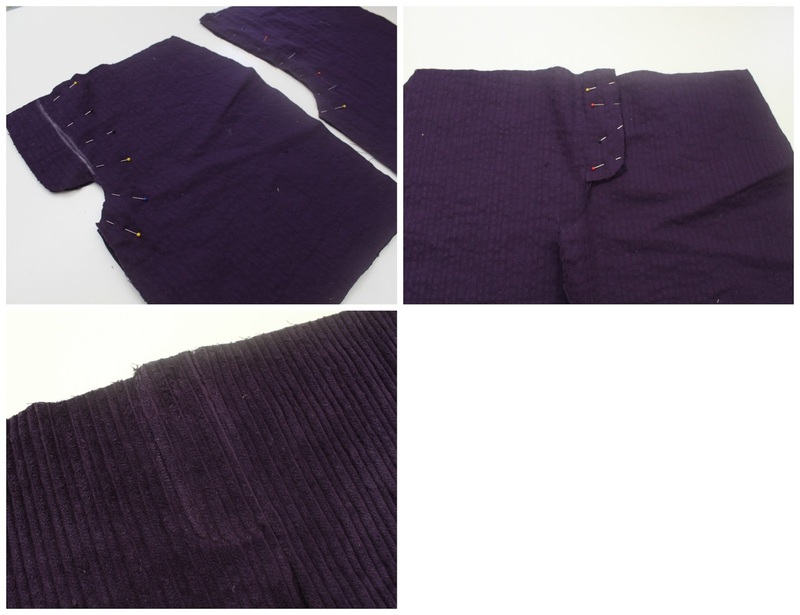 Now, just hand stitch a button right next to your elastic, and push the button through one of the buttonholes. I like to fold my elastic so that I can push the button through 2 buttonholes at once so the elastic lays nicely. ONE: sew a basting stitch around each leg. Gather to desired width. TWO: measure the new diameter of each leg hole, and cut out a rectangle of fabric 3 inches wide, and the length that you wrote down. THREE: place the raw edges of each end together and sew. Use an iron to press each edge 1/4 inch, then fold in half long ways with right sides facing out and use an iron to press. All the raw edges should be encased in your cuff. FOUR: encase the raw edges of your pants into your cuff, and pin all around. 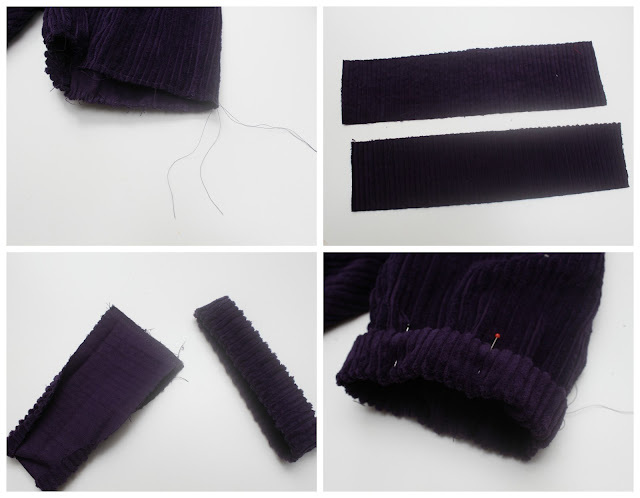 Sew around your cuff. FIVE: finally, hand sew a button on your pants. I made these knickers for my daughter, but a pair of corduroy knickers would look equally as cute on a little boy! I have some red corduroy in my stash, so my son may be getting a pair in the near future. So what have you been making for fall? Share your fall creations on Facebook, Twitter, or Instagram with the hashtag #SewingRabbitFallCollection for a possible feature on The Sewing Rabbit! Cute! Perfect for this time of year when it's still warm but moving towards fall.